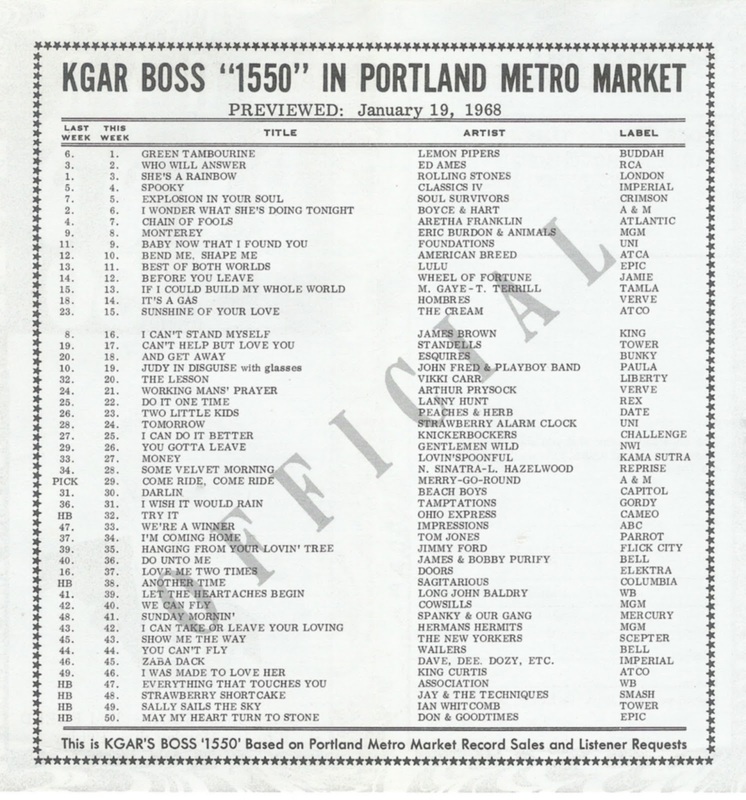 Although licensed to Vancouver, Washington, KGAR was actually broadcasting to and based in Portland! In this very cool chart, we are finding many local northwest US artists including local Portland boys, the New Yorkers. Their very British poppy sounding "Show Me The Way To Love" was attempting to break nationally 50 years ago, but it would be several years before a name change to the Hudson Brothers gained them widespread fame as music and TV stars. Note that another up and coming star is the top chart debut here at #29. Following their 1967 breakthrough, "Live," Emitt Rhodes and the Merry-Go-Round try for more success with "Come Ride, Come Ride." Although these aren't by any means the best way to represent them, I have to admit it is pretty cool to see two of my favorite '70's artists represented here on this 1968 chart. Emitt Rhodes won me over with his 1971 self-titled LP ... so much so that I sought out all of his earlier work. And I found The Hudson Brothers especially entertaining when they broke thru in the mid-'70's ... but this lame attempt at fake British accents on an otherwise not all-that-bad tune is almost embarrassing. They were SO much more talented than this. Some odd selections near the top of the list on this week's Oregon chart ... The Rolling Stones had the former #1 Record with "She's A Rainbow" (not typically considered to be one of their bigger hits) ... and Ed Ames is up at #2 with "Who Will Answer" ... again, not two songs you would typically associate with one another. Our FH Buddy Burton Cummings returns to The Arcada Theatre on Friday, March 23rd. Karla Bonoff has been added to The City Winery line-up … she’ll be appearing on Wednesday, April 4th. If you live in the Chicagoland area and go to a lot of concerts, you’ll want to sign up for this one! From time to time we get special ticket offers … discount seats and even free ticket give-aways. Be sure to use our NEW email address: kk@forgottenhits.com … and watch for special announcements on the website (and via email) when they become available. We’ve still got a couple of tickets to give away to see The Fab Four, a GREAT Beatles Tribute Band, performing at The Arcada Theatre on Friday, February 9th … which just so happens to be the 54th Anniversary of The Beatles’ first appearance on The Ed Sullivan Show. Meanwhile, between now and May 1st you can catch The Buckinghams with CTA (featuring Danny Seraphine and Bill Champlain, formerly of Chicago) this Sunday (January 21st), ABBAmania (a tribute to ABBA) on Sunday, January 28th, Echoes of Pompeii (one of the best Pink Floyd tribute bands you’ll ever see) on February 2nd, the aforementioned Fab Four on February 9th, Deacon Blues (an all-star tribute to Steely Dan) on February 10th, Gary Puckett and the Union Gap, The Grass Roots and The Cowsills on February 11th, The Gin Blossoms on February 17th, Starship featuring Mickey Thomas on February 23rd, Robert Cray (March 1st), The BoDeans (March 2nd), Uriah Heep (March 11th), Foghat with Savoy Brown (March 16th), Frankie Avalon (March 18th), Burton Cummings (March 23rd), Kenny G (March 25th), The Sweet (March 31st), Michael Bolton (April 4th), Ann Wilson of Heart (April 8th), Bobby Rydell and Lou Christie (April 15th), Engelbert Humperdinck (April 22nd), Mark Farner (of Grand Funk Railroad) on April 28th and The Cornerstones Of Rock (featuring The Buckinghams, The Ides Of March, The Cryan’ Shames, The New Colony Six and The Shadows Of Knight) on April 29th. And finally, let’s not forget our friends at The Genesee Theatre, who will be featuring The O’Jays (January 25th), Richard Marx with John Waite (January 26th), Priscilla Presley (February 2nd), Dennis DeYoung (February 10th), Herman’s Hermits featuring Peter Noone (with special guests Gary Puckett and the Union Gap), February 15th, The Million Dollar Quartet (March 4th), Boyz II Men (March 22nd) and Dave Davies (of The Kinks) with The Smithereeens on April 19th. John Fogerty is none too happy about the title of the new Taraji P. Henson movie, "Proud Mary." According to the film's publicity campaign, the storyline is being described as the tale of a "hitwoman working for an organized crime family in Boston. Mary's life is completely turned around when she meets a young boy whose path she crosses when a professional hit goes awry." Even more unfortunately, there isn't a damn thing anybody can do about it as you can't copyright a title. "There is a movie in current release called 'Proud Mary.' I don’t know much about it other than this. The main character is a black woman who is also an assassin. And apparently, her name is Mary. I wrote the song 'Proud Mary' fifty years ago, and I was very excited to have written such a good song. In fact, it was my very first good song. My songs are special to me. Precious. So it irks me when people seek to capitalize on the popularity of my music and the good will it has earned with the public for their own financial gain. Over the years, I have often found myself directly opposed to these uses. This movie has nothing to do with me, or my song. They simply picked the title and wrote a completely fictitious story around it. Back in the day, I had decided that I needed to become more professional, more organized about my songwriting efforts. I bought a little notebook and after few days, I wrote down the words Proud Mary. It was the very first entry in this book. At first, I didn’t even know what those words meant. I wrote the song about a mythical riverboat, cruising on a mythical river, in a mythical time. Perhaps, the setting was 'back in time' on the Mississippi River. It was obviously a metaphor about leaving painful, stressful things behind for a more tranquil and meaningful life. Far from a story about killing people for money." And then one night after a Taj Mahal concert, John ran into Bob Dylan and George Harrison backstage after the show. Dylan reportedly told him that he needed to start doing his music again … otherwise the world was going to think that "Proud Mary" was an Ike and Tina Turner song!!! Fogerty took the lesson to heart and has been performing a nice mix of his old and new music ever since, to satisfied fans all over the world. Neil Diamond will be one of the recipients of a Lifetime Achievement Award at this year's Grammys Ceremony being broadcast on Sunday, January 28th. I first heard Neil Diamond’s “I’m A Believer” in mid-October, 1966, when his producer, Jeff Barry, played it for me and the other Monkees, the phenomenal track that Barry had recently cut with Neil on acoustic guitar. Neil had already had a couple of hits on the radio that year — “Cherry, Cherry” and “Solitary Man” — but this was to be one of the biggest records of both his and my career. It came out just a few weeks after I sang the lead vocal; and by Christmas of ’66, it was headed for the #1 slot on Billboard, Cash Box and Record World. It went on to become a worldwide smash in 1967 for The Monkees. A timeless classic, Neil brought it back to the charts in his own re-recorded version in 1971, but these days I mostly have to tell kids that I sang it long before Shrek! Smash Mouth, of course, took “Believer” to the top as a part of that movie in 2001. Neil also wrote “Look Out (Here Comes Tomorrow),” which was on The Monkees’ second album, More of the Monkees, and the success of that and “I’m A Believer” inspired him to write our next single. “A Little Bit Me, A Little Bit You” was recorded in late January, 1967, and became a huge hit just a few weeks later. My late great buddy, Davy Jones, sang the lead on “A Little Bit Me, A Little Bit You,” and I honor him and Neil by singing it now at all of my solo shows, always taking time to mention how blessed we were to work with so many gifted songwriters, like Neil. In 2016, however, Michael and Peter and I reconvened to finish the track that Neil had started with Davy and producer Jeff Barry forty-nine years earlier! It ended up being a standout song on our Top 10 album, Good Times; our last Neil Diamond classic, and my last chance to sing with Davy Jones. Thank you, Neil, for giving me and everyone else so many good times and great hits throughout the years. It’s a distinct honor to have “As We Go Along,” a deep cut from the soundtrack of the Monkee movie, Head, appear on the soundtrack to the award winning Lady Bird; a tremendous film from Greta Gerwig, whose work I’ve always enjoyed. The track, which we recorded in 1968, with Ry Cooder and Neil Young, was always one of my favorites and I frequently perform it in concert. One of Carole King and Toni Stern’s best without a doubt. 1/14/ 1955 = Alan Freed's first live New York stage show. For the first time, 50 % of the audience was white. The St. Nicholas Rink opened in 1896 as a members-only skating club. In 1906, it became the St. Nicholas Arena and opened up to professional boxing: Jack Johnson, Rocky Graziano, and Cassius Clay a/k/a Muhammad Ali all fought there. On January 14 - 15, 1955, the pioneering disc jockey Alan Freed hosted his first New York rock and roll shows at the St. Nicholas Arena. The concerts, both of which sold out the 6,000-capacity venue in advance at $2.00 per ticket, featured an all-Black roster of performers including Fats Domino, Clyde McPatter and the Drifters, Ruth Brown, the Moonglows, the Clovers, the Harptones, Charles Brown, and Big Joe Turner. Based on his previous three years’ experience of promoting such events, Free wasn’t surprised by the SRO crowds. But as John A. Jackson wrote in his 1991 biography Big Beat Heat: Alan Freed and the Early Years of Rock & Roll, “what made the deejay’s St. Nicholas dance a milestone in the acceptance of rock and roll was the racial composition of the audience, which was estimated to have been half white — the first such documented ratio.” Alan Freed soon moved his rock & roll revues to other stages; the St. Nicholas Arena was demolished in the 1980s for construction of new offices for the ABC television network. The HBO documentary Elvis Presley: The Searcher debuts Saturday, April 14 (8:00-11:00 PM ET/PT) on HBO. This three-hour, two-film presentation focuses on Elvis Presley the musical artist, taking the audience on a comprehensive creative journey from his childhood through the final 1976 Jungle Room recording sessions. The films include stunning atmospheric shots taken inside Graceland, Elvis' iconic home, and feature more than 20 new, primary source interviews with session players, producers, engineers, directors and other artists who knew him or who were profoundly influenced by him. The documentary also features never-before-seen photos and footage from private collections worldwide, and includes an original musical score composed by Pearl Jam lead guitarist Mike McCready. RCA / Legacy Recordings, a division of Sony Music Entertainment, will release Elvis Presley: The Searcher, the musical companion to the HBO / Sony Pictures documentary, on Friday, April 6. It will be available in digital and physical configurations. Elvis Presley: The Searcher is an HBO Documentary Films Presentation in association with Sony Pictures Television; executive producers, Glen Zipper, Priscilla Presley, Jerry Schilling, Andrew Solt, Alan Gasmer and Jamie Salter (chairman and CEO, Authentic Brands Group); producers, Jon Landau and Kary Antholis; directed and produced by Thom Zimny. "Elvis Presley: The Searcher" … coming to HBO in April. New childhood music + New footage + Final recording . New Graceland shots + Springsteen interview. New gospel inspiration + Army years. New TV special + Royal Philharmonic Orchestra. Sounds like 2018 is going to be a good year for Elvis. Joel's ties run deeper than one might think with the members of Foreigner. Billy was the guy who inducted them into The Rock And Roll Hall Of Fame back in 2013 … and Mick Jones produced Billy's 1989 album "Storm Front." Speaking of The Beatles, The New York Metro 2018 Fest For Beatles Fans has some interesting guests this year … including the pairing of Peter Asher and Jeremy Clyde (Peter and Jeremy) along with our FH Buddy Billy J. Kramer, first time guest Randy Bachman (who’ll be performing songs from his brand new release “By George,” a salute to the music of George Harrison, Neil Innes, Mark Rivera and much, much more. Peter Asher also mentioned an interesting concept on his Sirius / XM Radio Program this week ... a proposed and discussed (but apparently never fully realized) pairing of Sting and Peter Gabriel. Story goes these guys got together and considered recording a new version of the Peter and Gordon hit "A World Without Love," written by Paul McCartney while he was living at The Asher's house (and dating Peter's sister Jane) in late 1963 / early 1964. I just heard this story on Scott Shannon's Show (WCBS-FM). 58 years ago Brian Wilson submitted this song to his music teacher. The music teacher gave Brian an F grade. This song went on to become the Beach Boys' first Billboard Hit in 1962. The principal recently announced that he's changing Brian's F grade to an A.
I'm glad he changed that failing grade. Now Brian Wilson will be able to get into a better college. Dolores O'Riordan, Danny Woods and Edwin Hawkins. I guess the surprise (and the one that got the most media attention) would have to be Dolores O’Riordan … probably more because of her age (46) than anything else. I guess I never really thought of The Cranberries as being that universally popular. They had one Top Ten Hit in 1994 (“Linger,” #8), although I’m probably more familiar with “Dreams,” which reached #22 later that same year. Danny Woods was a founding member of Chairmen Of The Board, who had a HUGE Pop Hit in 1970 with “Give Me Just A Little More Time,” which I still hear virtually every single day 48 years later. Edwin Hawkins, of course, reached The Top Five with “Oh, Happy Day” the year before … but he was 74, so it was less of a shock here. On January 16th, legendary engineer / producer Eddie Kramer premiered “Mannish Boy” by Jimi Hendrix on BBC Radio 6 Music’s Shaun Keaveny Breakfast Show. The track is currently available globally on all digital platforms for purchase and streaming. “Mannish Boy” is a foretaste of Both Sides of the Sky, the new Hendrix album set for release March 9 from Experience Hendrix L.L.C. and Legacy Recordings. Muddy Waters’ “Mannish Boy” was reworked by the trio that would come to be known as Band of Gypsys (Jimi Hendrix, bassist Billy Cox, drummer Buddy Miles) during their first ever recording session on April 22, 1969, at the Record Plant in New York. This lineup would make its public debut during four performances at the Fillmore East on New Year’s Eve 1969 and New Year’s Day 1970, from which the live albums Band of Gypsys (1970) and the acclaimed Machine Gun (2016) are derived. Both Sides of the Sky, the album home of “Mannish Boy,” is the final volume in a trilogy of albums intended to present the best and most significant unissued studio recordings remaining in Jimi Hendrix’s archive. It follows Valleys of Neptune (2010) and People, Hell and Angels (2013), which both cracked the top 5 on Billboard’s Top 100 album chart. Recorded between January 1968 and February 1970, and featuring appearances by Stephen Stills, Johnny Winter and Lonnie Youngblood, Both Sides of the Sky contains 10 unreleased tracks. It will be available on CD, digital, and as a numbered 180-gram audiophile vinyl 2LP. The project was co-produced by Eddie Kramer, Jimi Hendrix’s recording engineer on all of his albums made during his life, along with Janie Hendrix and John McDermott. Surf Rock Guitar Icon MERRELL FANKHAUSER AND FRIENDS Brings The Magic Of His Long Running TV Show TIKI LOUNGE To CD! One of the true innovators of surf rock music, Merrell Fankhauser, has been a mainstay on the music scene in both California and Hawaii for decades, not only performing live but also producing a much-loved TV variety show, “The Tiki Lounge.” Now, fans of all ages can discover the magic Fankhauser creates with this live concert album, Tiki Lounge Live, set to be released on January 12 via Goldenlane Records. Enjoy performances by Fankhauser as well as special guests Ed Cassidy of Spirit, The Brymers, Lindsey Ikeno, and more! Merrell Fankhauser’s career began in the 1960s with the instrumental surf rock group The Impacts, whose hit album Wipe Out is now revered as one of the era’s best surf rock albums. He later formed two other bands, Merrell and the Exiles and H.M.S. Bounty, before embarking on a formative move to the island of Maui in 1973 with his group MU. Later projects found Fankhauser collaborating with everyone from drummer Gary Malabar of The Steve Miller Band and John Cipollina of Quicksilver Messenger Service, Nicky Hopkins, Peter Noone, and John McEuen of "The Nitty Gritty Dirt Band" and many more. Three Dog Night registered 21 Billboard Top 40 hits (with three hitting number one) between 1969 and 1975. Guitarist Michael Allsup was there then, and is still with the current Three Dog Night. While Michael Allsup was not the original guitarist for Three Dog Night, he has been with the band since the first year of their inception. It was shortly after the band officially formed with Ron Morgan on guitar, Allsup stepped in to replace Morgan. And while he has taken some time away from the group over the years, he has been with the current touring lineup since 1991.